I'm a guy who had the funds available to buy a suit to dress up as Samurai Guy, neat! THEN, I said to myself "But what if I made a suit of armor myself?" And then a friend joked/dared about making it Hello Kitty themed...and so I said "okay" and yep. Now of course I had to make another, so now there is a Pikachu Samurai as well! Want a real samurai name? Do you like samurai? Do you think that your interest in samurai would be better achieved with a authentic samurai name and certificate with actual meaning behind it as opposed to something sounding out your name? Check out beasamurai.com/ to find out more! He gave me a free run of his service and though it may seem expensive, it is a very surprisingly well detailed and in depth execution towards bestowing your samurai name hosted by his family name! I saw your costume at Anime Revolution; absolutely brilliant! Saw you at Anirevo. Great cosplay!! Saw so many people took your pic! Dude! 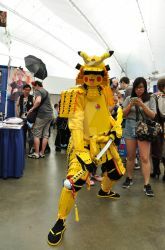 Fantastic Samurai Pikachu. So amazing that I got to see you at AniRevo. it was a grand ol time overall there, thanks for taking me pic! No problem. You are great. DUUUUUUDE I didn't know you had a DA account!!!! Caught this on imgur! Not sure if fan or self post ( www.imgur.com/gallery/ZChF6 ) very nice pikachu concept!